As a young student growing up in Tarkwa Breman, a rural village in Ghana, Shadrack Frimpong was surrounded by many bright peers, both male and female. But as the years passed, many of the female students stopped coming to school. The notion that investing in girls’ education isn’t worthwhile is one that Frimpong has vowed to challenge. Now, as one of the winners of Penn’s inaugural President’s Engagement Prizes, he aims to make a difference for the girls and families of his village as well as several surrounding communities. His prize money will go toward the construction of a facility in his village that will comprise a school for girls and a medical clinic, the Tarkwa Breman Model School for Girls and Community Clinic. The President’s Engagement Prizes, the largest of their kind in higher education, provide winners with as much as $100,000 to support project implementation and $50,000 for living expenses. Launched by Penn President Amy Gutmann, the awards are supported by Trustee Judith Bollinger and William G. Bollinger, Trustee Lee Spelman Doty and George E. Doty Jr. and Emeritus Trustee James S. Riepe and Gail Petty Riepe. Even before the Prizes were created, Frimpong, a biology major with extensive global health coursework, had set his mind to making a difference in access to both education and medical care in Africa. During his childhood, he witnessed friends and family members suffer from diseases such as HIV/AIDS and hepatitis B. The nearest medical center to his native village is several miles away, too long a trip for many to make easily, much less while ill. And the closest comprehensive medical clinic is 150 miles away. He also realized that the failure to provide an education to girls led them down a risky path. The academically gifted girl from his school whose education was cut short, wound up contracting a sexually transmitted disease and gave birth to a child while she was still a teenager. 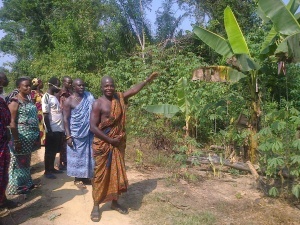 The chief of Tarkwa Breman and village elders show off the 100 acres of land to be donated for the school and clinic. “My friend’s situation showed me how health and education are inextricably linked,” Frimpong says. During his time at Penn, he has made headway in his goal to improve both health and education in Africa. Students for a Healthy Africa, which Frimpong established during his freshman year, has provided free health insurance for HIV/AIDS orphans in Ghana and constructed a health clinic and potable water well in two communities in rural Nigeria. Last year he also co-founded African Research Academies for Women, a project highlighted earlier this year by the Clinton Global Initiative, which organizes annual summer research institutes for college women in Ghana and Nigeria. Key to Frimpong’s success has been his willingness to seek out assistance and mentors. The heads of the research labs in which he has worked, including Michael Betts, Una O’Doherty, Elizabeth Lowenthaland Robert Gross of Penn’s Perelman School of Medicine, have helped usher him towards topics that match with his interests in medicine and health policy. Penn faculty members like Penn Medicine’s Roy Hamilton and Larry Gladney of the School of Arts & Science’s have helped him shape his future in academic medicine. Being several thousand miles away from home as an international student hasn’t been easy, and he credits his college advisor, Tanya Jung, with helping him to balance his academic workload with his extracurricular projects. When the opportunity for students to apply for the President’s Engagement Prizes was announced last summer, Frimpong recognized it as a perfect opportunity to obtain the support he needed to bring his dream of creating a clinic and school in his village to fruition. 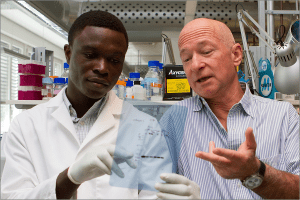 To put together the application, he needed a mentor, and came upon an ideal match in Harvey Rubin, a Penn Medicine professor who maintains a basic biology laboratory while simultaneously engaging in development work in Africa. Rubin’s “Energize the Chain” project, which utilizes cell phone towers’ energy grids to power refrigeration for life-saving vaccines, is currently rolling out across Africa. Rubin has collaborated with the governmental as well as nonprofit entities and had the knowledge that Frimpong needed to organize and build momentum and support for his project. Rubin was eager to help. Indeed, Frimpong’s plans for the rollout of the school and clinic are comprehensive. With the support of his parents, he met with his village’s chief, who arranged for the donation of 100 acres of land on which the facilities will be built. A portion of that land will be cultivated. Students’ families will work on the farm once a week in exchange for a free education for their daughters. Revenues from the cocoa crops will help pay for the school’s maintenance costs, and the school’s library will be open on weekends to the community. Frimpong hopes to offer places at the school for 200 girls, ages 5 to 17. The community clinic will include consultation rooms, a pharmacy, a dressing/injection room, a laboratory, a delivery room and an on-call room. Frimpong is working with the Ghanaian ministries of Health and Education to supply teachers and doctors to staff the school and clinic. The goal is to open the facility in July 2016. Frimpong will be in Tarkwa Breman this summer to oversee plans for the school and clinic. Penn architecture students, guided by Richard Wesley of the Penn School of Design, will also be traveling there to survey the land and design the building. Then, starting in the fall, Frimpong will be going back and forth between Ghana and the U.S. He hopes to attend medical school beginning in the fall of 2016, pursuing joint degrees in medicine and health policy. Though his plate will be full, Frimpong knows that he has the support of his family, his community and his university to ensure that the clinic and school succeed, providing new outlets for education and medical care to communities in need of both.